If there are 7 basic deadly sins, are there not also 7 basic life-producing virtues? That question was the motivation for this book. We choose to focus either on doing battle with the sins or on developing the virtues. Since the object of our focus is what most frequently influences us, it is important to focus on the development of the habits that produce the 7 virtues. But this is no "just act right and you'll be okay" philosophy. While we must develop the habits, the key lies in what God through Jesus Christ has given us: "His divine power has given us everything we need for life and godliness.you may participate in the divine nature and escape the corruption .caused by evil desires." (1 Peter 2:3-4) By carefully balancing our role and God's provision, 7 Habits of Highly Healthy People is a powerful journey into spiritual health. AUTHOR BIO The Rev. Curry Pikkaart earned his BA degree from Central College in Pella, Iowa and his Master of Divinity degree from Western Theological Seminary in Holland, Michigan. He has been a minister in the Reformed Church in America since 1974 and has pastored churches in Sioux Center, Iowa, and Holland, Kalamazoo, and Grand Rapids, Michigan, and currently serves as Pastor of the Hope Reformed Church in South Haven, Michigan. Pastor Curry and his wife Barbara are the parents of 3 married boys, and the grandparents of six grandchildren. He and Barbara previously produced "TNT (Tempted, Nurtured, & Triumphant)," a small group discipleship resource. 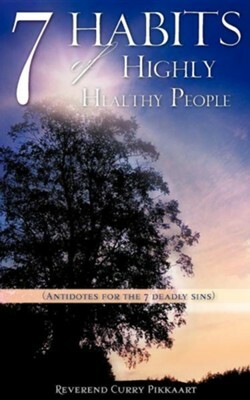 I'm the author/artist and I want to review 7 Habits of Highly Healthy People.